FARGO, N.D. — The National Sports Media Association (NSMA) has named Fargo-Moorhead RedHawks’ play-by-play announcer Jack Michaels, as the 2018 North Dakota Sportscaster of the Year. The award is presented to the sportscaster who receives the most votes among state members of the NSMA. Michaels began calling RedHawks games in 1996 until 2005 and returned to the team in 2016. In addition to calling RedHawks games on the radio, Michaels is the current play-by-play announcer for the University of North Dakota football and women’s basketball programs. He also hosts the daily “Jack Michaels Show” on 740 The Fan (KNFL-AM) and is the sports director for Midwest Radio Fargo-Moorhead. In his 26-year career, Michaels has called games for professional, collegiate and high school sports across the upper Midwest. 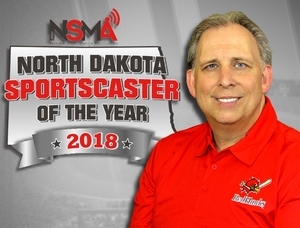 This is his first North Dakota Sportscaster of the year award and will be honored during the 60th annual NSMA Awards Weekend, June 22-24, 2019 in Winston-Salem, N.C.